This includes 5 well crafted gin cocktails each, 5 bespoke gins to taste, your private gin carriage (a new Mercedes mini bus) to the 5 gin inspired venues, your very own gin guardian and an area reserved in each bar. Throughout the event the group will learn all about the history of gin and the production process of gin. You’ll be taught how to taste gin, visit a stunning distillery and pretty much become immersed in the stuff. The Gin Journey is a fun loving voyage into the world of gin and a unique experience you won’t find anywhere else on the planet. In London these generally run around East London/Shoreditch but if you fancy Bermondsey or Notting Hill let me know. In Manchester and Liverpool they are based centrally and we can drop you off and pick you up wherever you like (within reason) to ensure the event is as easy as possible for you. An opportunity to order food at one of the venues can be organised easily too, the price will be on top of what is quoted above. Let us know and we’ll send you over a menu. 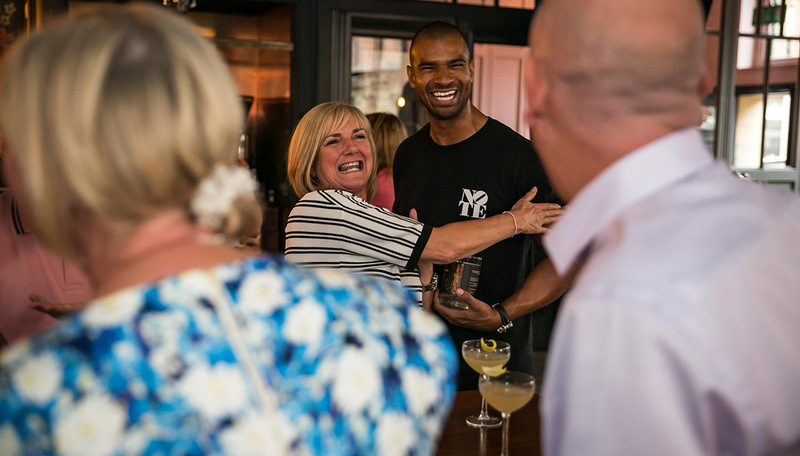 Our events go down a storm for gin lovers and newcomers alike. Check out what other people say about us here on Trip Advisor, they love it. Our Private Gin Journey is for a minimum of 12 people and a maximum of 32 and is a completely bespoke and private tour. The Private Gin Journey is £120 per head plus VAT in London and £100 per head plus VAT in Manchester and Liverpool for a 4:30 hr tour. Email theginboss@ginjourney.com to enquire. Victory London Distillery’s gin making masterclass is perfect for private groups to enjoy an event in an intimate space. Victory London Distillery is located, in Seven Sisters alongside Five Miles bar-restaurant, nightclub and brewery. It is here that you will be welcomed in to our private tasting room adjacent from the distillery laboratory. Sit down with Master Distiller Max Chater and learn about his unique modern distillation process and the history of our nation’s favourite spirit whilst sipping on gin cocktails. The group will then distil their very own gin and take a bottle each home with them too. You get a 700ml eco-pouch of VICTORY Cold Distilled Gin each, a 200ml bottle of your own custom gin, some tasty Victory cocktails, a guided gin tasting, an explanation of how to make the lovely juniper flavoured stuff using a rotary-evaporator (super scientific gin still) and some team bonding botanical blending. Private bookings of up to 30 people can be accommodated and it prices at £100pp plus VAT for a 3/4 hour event. There’s a chance to order food during the class from Torshi Restaurant at Five Miles (not included in the price). Only in London.